The families of their academic colleagues in Iran are desperately trying to raise bail money to get their loved ones out of jail. Some like Dr. Maleki are even close to death and their families have had no contact with them since they were arrested. Tens of Iranian students have been killed by the repressive forces, thousands are in the dungeons and thousands have been banned from further education for expressing their opinions, but that doesn't stop these Judas SOAS academics collecting their 50 gold coins and worthless trophies. Pictures show Dr. Anna Contadini lecturer in Art and Archaleogy at SOAS and Mohammad Abdel Haleem, SOAS lecturer in Islamic studies, happily receiving their awards from non other than the head of the messianic administration junta responsible for so many human rights violations in Iran. No one has betrayed the Iranian pro-democracy movement more than UK universities and academics. 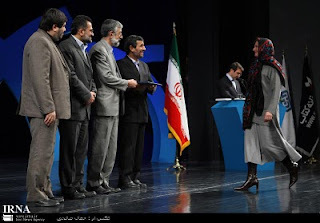 They should ask themselves if this pathetic ceremony and even more pathetic award worth betraying Iranian people, and in fact any freedom fighting people all over the world? For the love of god...we are the loneliest people in the world...while those moronic Palestinians who cause half of their own problems get the sympathy of the whole of the UK's academic community, us Iranians are routinely ignored, or worse, betrayed by these morons. You say: "No one has betrayed the Iranian pro-democracy movement more than UK universities and academics." On two occasions I have refused to become a propaganda pawn of the regime by accepting prizes given to me by the IR on account of my academic work. Don't tar us all with the same brush. You are the epitome of an academic willing to do anything to gain favor with the regime so they may fund your Iranian studies program (see, e.g. Guardian article linked to by anon.)! Please don't rub salt on our wounds and add insult to the injury with your lies. First of all, you always claim everyone is against Iran or againt freedom just because they don't bow down at your alter of Iran hating. "while those moronic Palestinians who cause half of their own problems get the sympathy of the whole of the UK's academic community"
Why would you call the Palestinians moronic? What have they done to you to deserve that insult. Also, explain to me how their situation is their fault? Really, I want to know your reasoning. "us Iranians are routinely ignored, or worse, betrayed by these morons." how are Iranians betrayed by the people in the UK? You say we are betrayed by them, and in the next breath you claim they are morons! you're an idiot! and for the record, don't say "we." you're not an Iranian, you're a traitor. Universities tend to sell themselves to the highest bidders. Islamic Republic is disliked by most people but it has its hands on Iranian people's cash and uses it to buy support. Those who support them or who are paid by them are prostituting themselves for money. There is no longer the pretext of "ideological reasons" as we now know that the Islamic Repugnant does not follow any particular ideology; it is run by Sepah Pasdaran, the revolutionary guards, a terrorist organisation. England is in toilet with its massive Muslim immigration problems, inflation, political corruption and mess. Hope they go down the toilet hole even further. Winston, if you don't like it here, you know where the door is. I am in complete agreement with SZ comments. You really need to remember that you live here, england, so as for name calling against the british government, I really think you have no grounds to stand on, as you are an immigrant and obviously an original refugee. As you rightly point out potkin, you havent been to Iran for many many years, you need to go there and stand with the people. Breath the same air as them and then you will realise where you have been going wrong. Hearts and souls aren't won by such manufactored processions. They are won by the true 'Lion Heart's' who are not afraid to stand up for the rights and freedom's of a cheated and brutalized people. So let's not forget - AZADI IRANI! The fact is that a secular and modern Iran, a peaceful middle east, is a threat to UK's financial interest in the region and that's why they are trying very hard to keep the Islamic regime alive as long as possible. Seems you all have chips on your shoulders. poor me, poor me...get over yourselves. This is about academia rather than 'point the finger in blame'. University is there as a forum for academic discussion and substantial research, even if it is not what you agree with. The academics here have had their work rightfully recognised by someone, that's all. yeah right! 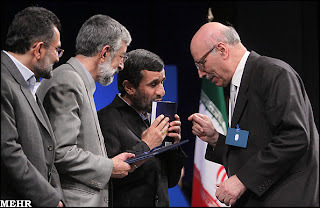 Anna Contadini's work is recognised by Ahmadinejad in the field of human rights! More comic than academic. The levels of delusion here are astronomical. No-one, including Durham University academics deny the oppression of regimes from whom they receive funding ... they do however point out the duplicity of those people who ardently point out the fact, yet accept funding from a government whose track record for human rights violations and contraventions of international human rights law, the Geneva Conventions and the UN Charter, makes the regime in Iran look almost benevolent in comparison!